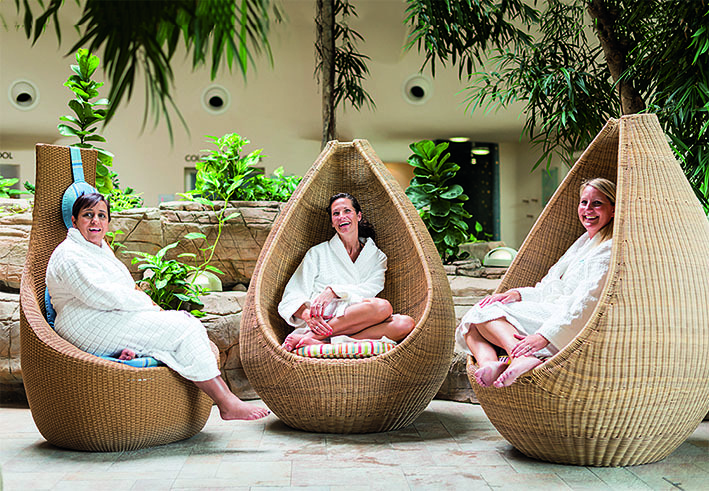 Bathing in hot springs for our health is one of the oldest spa experiences, dating back to Roman times. So it’s no wonder that a couple of thousand years later, we’re still enamoured of their appeal. In fact, thermal spa therapies are bang on-trend and gaining in popularity for those of us wanting sociable, affordable and beneficial treatments. 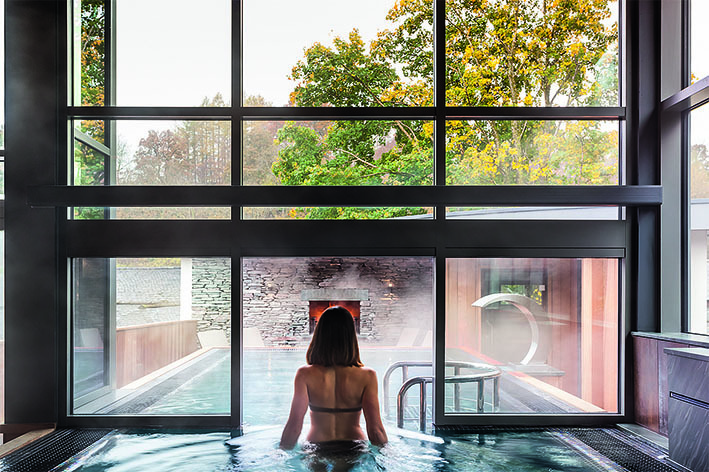 Estimated to be worth more than an incredible £1.5 billion, the UK spa market is ever evolving, with more than six million visits to spas annually. 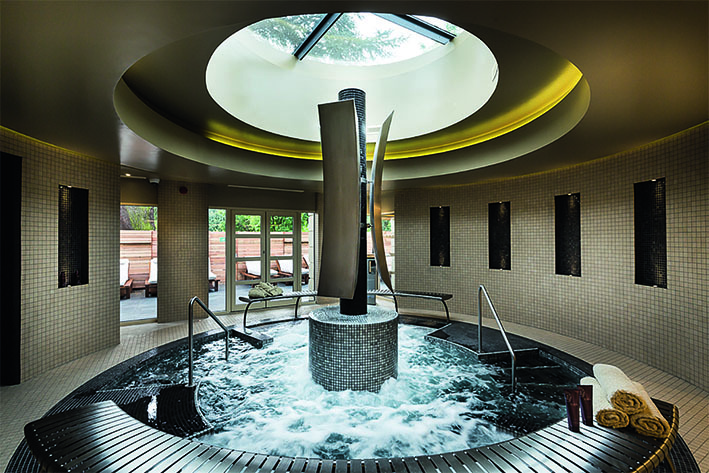 With so many spas to choose from, with prices to suit all budgets, we have spent the last 12 months selecting only the very best to feature in our awards. Each has been rated for best treatments, value, quality, choice of food and ‘wow’ factor, so you can be sure of having your best spa experience. that leaves you wanting more. 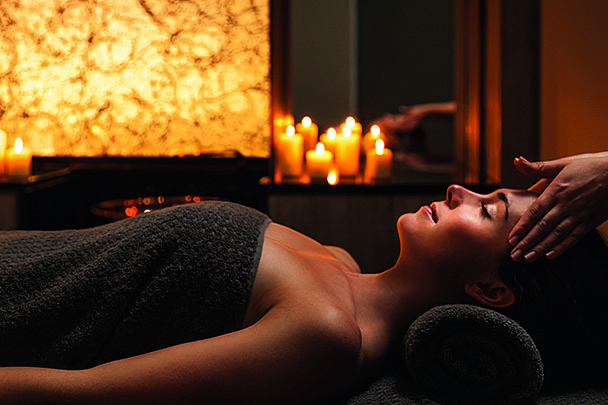 ESPA Swedish Body Massage, 55 minutes, £72 Experience deep relaxation and drift away during a full-body massage. Using ESPA aromatherapy massage oils chosen to suit your mood, aching muscles are left soothed and you leave feeling revived and with skin silky soft for days afterwards. 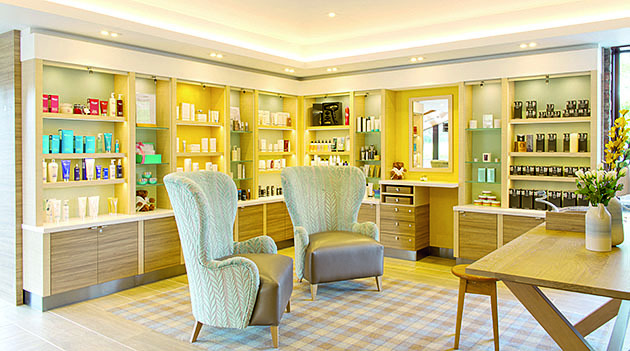 ESPA Personalised Express Facial, £42 Get exactly what your skin needs from a facial with this targeted treatment. After a consultation and SkinVision analysis, a mixture of cleanser, exfoliated, facial mask and booster serum all suited to your specific skin requirements leaves your skin looking and feeling fantastic. Dinner at The Grill Room offers an exciting modern seasonally changing English menu prepared with ingredients sourced from the restaurant’s own vegetable gardens. Make the most of good weather and choose to eat alfresco at the pretty Terrace restaurant. Take afternoon tea in one of two lounges and don’t forget to make time for a pre-dinner drink at the Cocktail Bar. 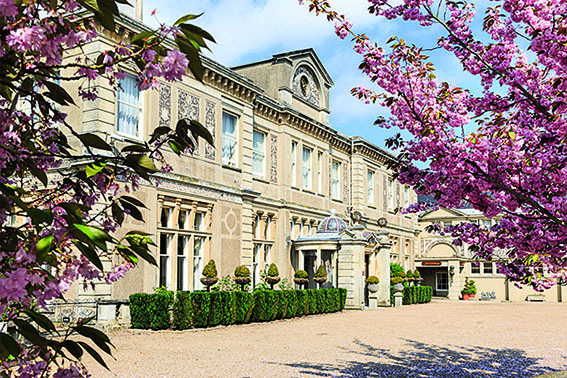 The hotel offers picnics in the summer months that can be taken into the glorious grounds, plus special events such as a weekend of live music with Jools Holland and James Morrison in June 2019 and detox and yoga retreat weekends. Keep checking the website to see what other special events it has on the horizon. 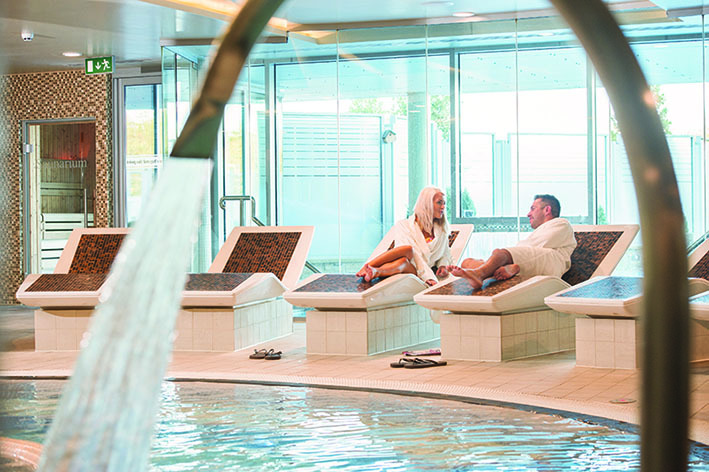 Simply Spa Stays start from £254 per couple and include a £24 allowance per person for dinner at The Grill, bed and breakfast, a 25-minute back, neck and shoulder massage each plus two hours at the Wet Spa. and woodland. If your other half doesn’t do spas there is an 18-hole parkland golf course. The Spa has a special couples’ treatment room. Ultimate Vitamin Glow Facial by Decléor, 55 minutes, £70 midweek, £80 weekend This amazing facial certainly lived up to its award- winning name. With stress- relieving massage, a warm skin-decongesting mask and products packed with vitamins and antioxidants, our tester’s middle-aged skin really glowed. Results lasted a few weeks too. Sonoma Aromatherapy Massage, 55 minutes, £73 midweek, £83 weekend The ideal massage for people who don’t do massage! It’s designed as a relaxing massage, so it is gentle without being ticklish. We loved the warmed aromatherapy balms used and the calming massage strokes really relieved any back knots. The Wine Press restaurant is quite large but has cosy, intimate areas if you want a bit more privacy. The food is of a very high standard: you can have locally sourced Donnington Burgers, or Gin Cured Salmon from the extensive menu. They serve a great Sunday lunch, and the breakfast make-your-own waffles and pancakes were to die for. The well-stocked and reasonably priced bar has a great atmosphere and a small outside area if the weather is warm. The intimate, friendly and well-designed spa which never feels like it’s part of a business hotel. The staff are easy-going and skilled, a nice combination. 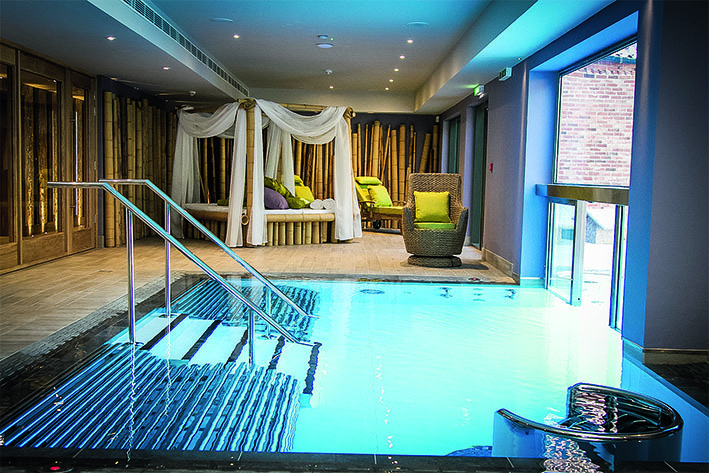 Spa breaks start from £99. spa itself is super clean and ultramodern and the staff are courteous and very friendly. Holistic Facial, 55 minutes, £80 Using natural Bespoke Aroma products to cleanse, exfoliate and tone, this is a heavenly facial. Once skin is clean, a natural clay mask draws out impurities and softens skin. The facial massage lifts and tones and the addition of a scalp massage leaves you on cloud nine. Glorious Mud treatment, 55 minutes, £75 Once you’ve been body-brushed from top to toe, your gently tingling skin is smothered in a warm and mineral-rich mud to nourish and purify skin. You’re then cocooned in a warm wrap to drift away with a face and scalp massage. Bliss. This is out of this world. Breakfast is relaxed with a buffet-style dining room and the included à la carte dinner in the Lake View Restaurant is MasterChef-worthy. The residents’ lounge has a well- stocked bar, perfect for relaxing in. There’s also the Courtyard Bar and Brasserie for more relaxed dining. Complimentary sherry, brandy or port on arrival, naturally flavoured citrus water available all day at reception, the stunning views and the extremely skilled therapists. 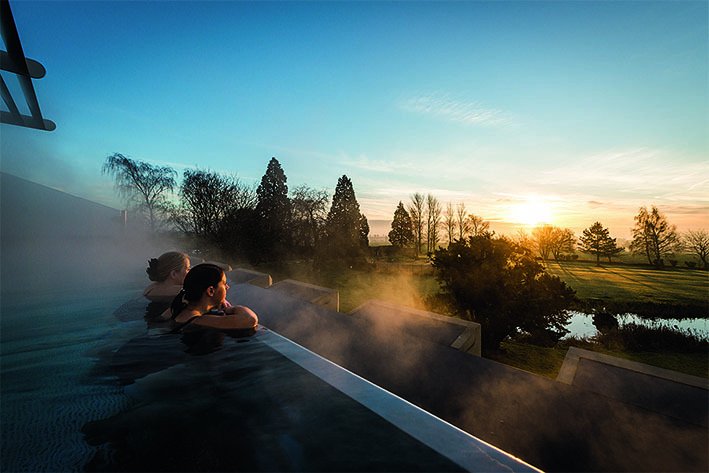 From £345 per Club Room per night including breakfast, a three-course evening meal, a 55-minute treatment each and full access to the spa on the Escape package. Room upgrades from £395 for a Spa/Superior Room (recommended) and £545 for a Studio Suite. 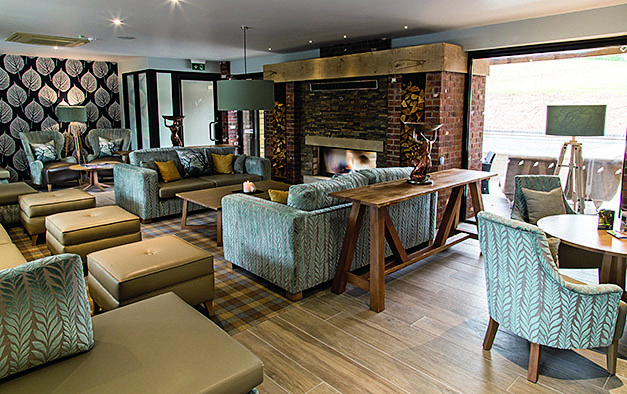 in the heart of the Staffordshire countryside where you can relax, unwind and indulge in complete comfort. Elemis Touch Skin Solutions Facial, 55 minutes, £75 Targeting oiliness, dullness and sensitivity, this therapeutic facial calms fractious skin to create a healthier, glowing complexion. In under an hour, you’ll suddenly have soothed, rejuvenated and rehydrated skin. Elemis Freestyle Deep Tissue Massage, 55 minutes, £70 Using aromatic oils tailored entirely to your needs, this flowing massage releases tension and toxins deep in your muscles, encouraging optimum circulation. Expect a firmer pressure with this treatment to deal with those knots thoroughly and you’ll feel exhausted yet looser as a result. The stunning award-winning lakeside restaurant overlooks the hotel grounds and is a real treat to visit. The mouth-watering menu uses only the freshest local organic ingredients and the chefs are truly outstanding. There’s even a dedicated vegan menu. The beautifully decorated luxury suites with their own private decking area and access to a shared hot tub, exclusive to overnight guests. We also loved the cosy relaxation lounge with an open fireplace. 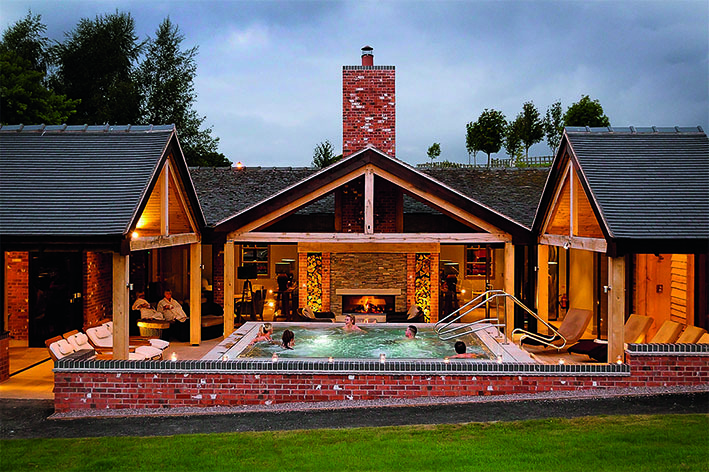 £295 for two people sharing a room including breakfast, dinner and use of spa facilities. Boutique spa suites from £295 per night per couple. Very green and eco- friendly, this luxury adults-only hotel and spa is perfect for lovers of the outdoors looking to relax in tranquillity. The hotel blends effortlessly into the greenery of the trees, with 16 state-of-the-art suites with wood-burning stoves and stunning private verandas. Scintillate Facial, 55 minutes, £90 Using natural Pure Alchemy products, this facial is suitable for all skin types. After exfoliating to stimulate new skin cells, skin is nourished with a cleansing facial oil and a careful and invigorating massage, leaving skin feeling fresh, clean and rejuvenated. Spellbind Full Body Massage, 55 minutes, £90 Choose a scent for the therapist to mix with a blend of lusciously warm oils before using with muscle-comforting techniques to give a soothing experience for body and mind. Designed to mesmerise, the massage will leave you feeling calm and very sleepy. 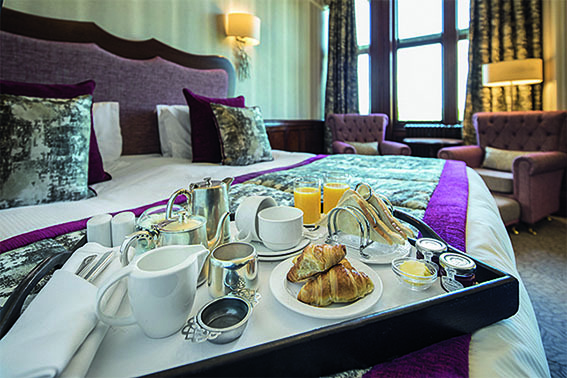 Breakfast is relaxing – a full choice of food is served in your room. The Stove restaurant offers dishes such as pickled mackerel and Cornish brill, pizzas, pasta, burgers and a selection of wines, beers and cocktails. The Spa Deli has a wide range of delicious refreshments. 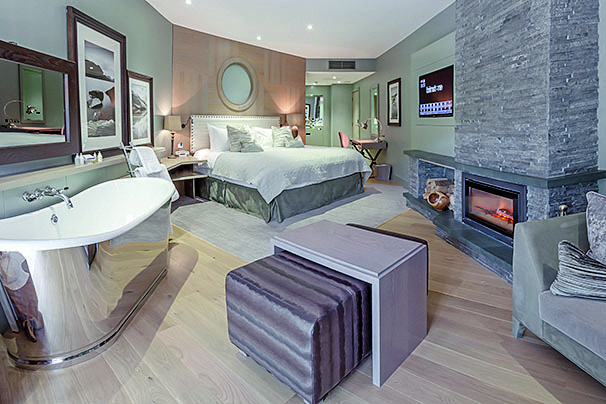 The 16 designer suites have to be seen to be believed and the hotel and spa is immaculately clean. Hosts are on hand to assist in any way they can – the service and attention to detail is second to none! 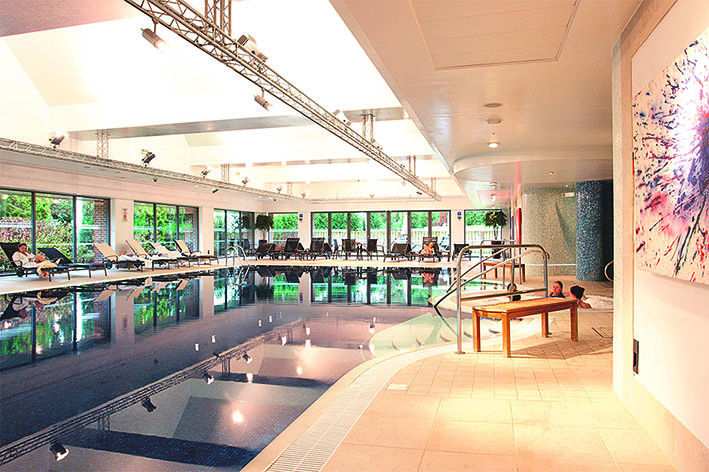 A Plush Room costs from £350 per night, which includes breakfast and use of the leisure facilities and spa. Spa in numbers… Treatment rooms: 10 including The Bubble (a couples’ private spa) Therapists: 16 Treatments: 17 including manicure and pedicure Pools: 2 Relaxation areas: 2Extras: The stylish and comfortable Reading Room offers daily complimentary wine, beer, hot and cold drinks as well as canapés, snacks, cakes and sandwiches Fitness areas/classes: There is a fully equipped gym and exercise studio offering an assortment of classes on demand. Decléor Ultimate Glow Prescriptive Facial, 70 minutes, £76 This is an award- winning facial, packed with vitamins, antioxidants and an aromatherapy elixir tailored to your type of skin to soothe, relax and relieve tension. The warm face mask leaves skin cleansed and soothed. There are six areas of focus – we chose Hydration and Radiance, which left skin feeling less dry, noticeably softer and radiant. There is a healthy choice of breakfasts, served in your room or in the Verandah Bar. The hot and cold buffet lunch is legendary – there’s something for every palate. Dinner is a three-course candlelit affair (you can stay in your robe) with cocktails and mocktails aplenty plus wines, beers and spirits. This spa gets busy but it never feels full and there are no queues. Staff are pleasant and attentive to ensure you have the best experience possible. The Rooftop Infinity Pool and the viewing lounge make it a special place to relax. An Overnight Reviver Break is from £231 per person (based on two sharing) and includes breakfast, lunch, dinner and a treatment. 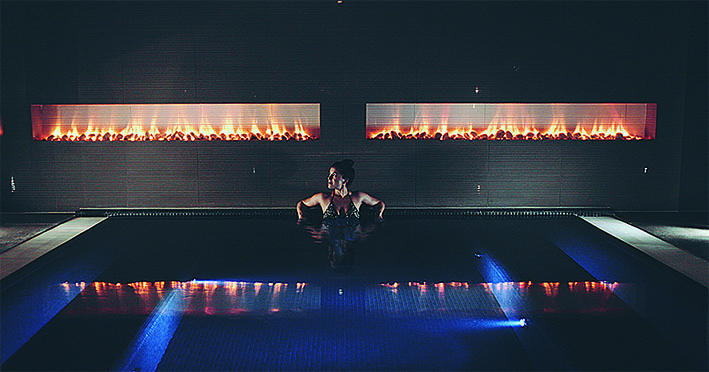 Your relaxation at the spa, which is set in 100 acres of countryside, starts when you arrive. The staff are welcoming and the spa itself is light and airy – except for the Serenity Pool, which is dark, warm and quiet, ideal for total relaxation. Divine Comfort Signature Treatment, 60 minutes, £72 An aromatic massage of the feet is followed by a dry body brush to increase circulation, then a nourishing coconut oil is applied to the skin. A massage of the shoulders, neck and scalp leave you feeling blissfully relaxed. Decléor Jasmin Glow Power Booster, 30 minutes, £50 An intensive moisturising hydrogel mask leaves skin feeling beautifully hydrated and luminous and soft all day long. There are cocktails and generous portions of tapas at the Terrace Bar near the outdoor hot tubs and infinity pool. 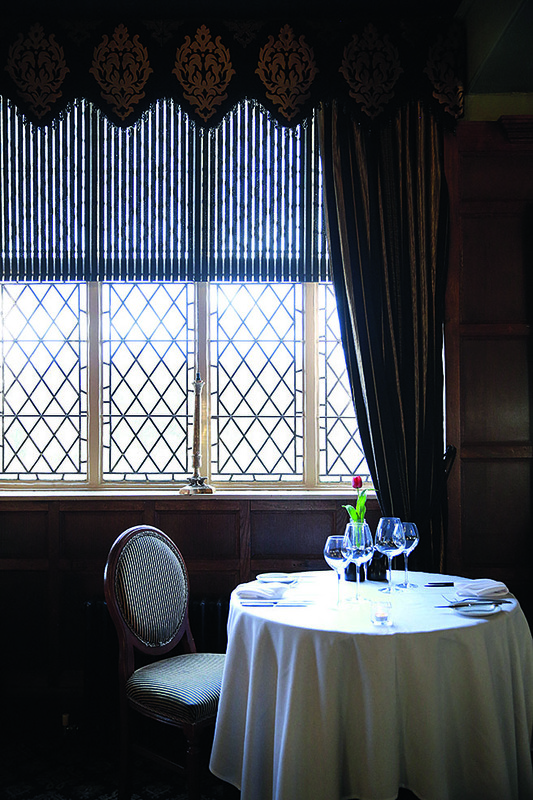 Bertram’s, the spa restaurant, has panoramic floor- to-ceiling windows and an eclectic range of dishes – some exotic, some with a Lancashire theme. Breakfast in The Lounge includes local award-winning produce plus tasty smoothies for the healthy-minded. The accommodation, which was contemporary and tastefully decorated and had a private patio and garden. The generous-sized food portions in both the Terrace Bar and Bertram’s. All staff were helpful and friendly. A luxury bedroom for two with dinner, bed and breakfast costs from £124 per night, which includes entry to the Thermal Experience for one day. Spa robes, towels and flip- flops are provided. This 17th-century property has been updated with rich fabrics, opulent furniture, quirky artefacts and ornaments and an art deco-styled bar. 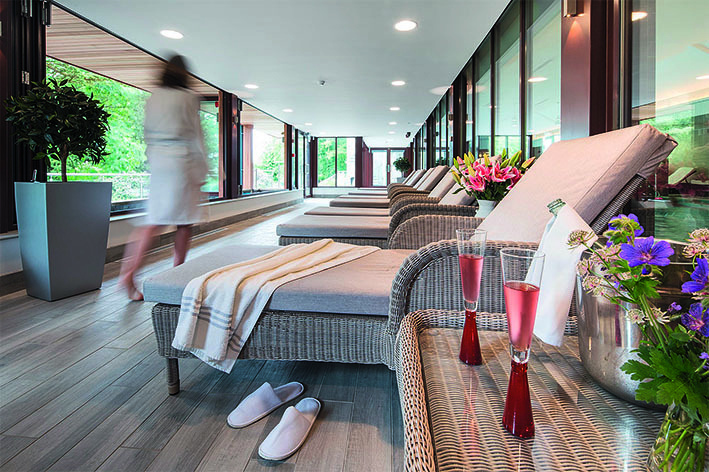 In contrast, the multimillion-pound spa is barely two years old and its state-of-the-art facilities will leave you pampered and relaxed. Hydracure Intense Hydration Facial, 60 minutes, £75 Relax on your heated bed before warm stones are applied to all your pressure points. The aim is to provide skin with the natural healing ability to retain moisture. Using a unique ‘hydractive’ blend of ingredients from Germaine de Capuccini, the neck and face are exfoliated and cleansed before a hydrating mask is applied. While it’s working its magic, you enjoy a mini treatment of your choice – we opted for a neck and shoulder massage. The end result is tighter, glowing skin. Sabbia Med, 30 minutes, from £20 per person (up to four people) This uplifting treatment replicates sunrise to sunset in just 30 minutes in a beach-like setting. Relax in a deckchair, sink your toes into the sand and enjoy the sounds of the seagulls and the lapping waves as low levels of UV lighting release vitamin D. We loved it! 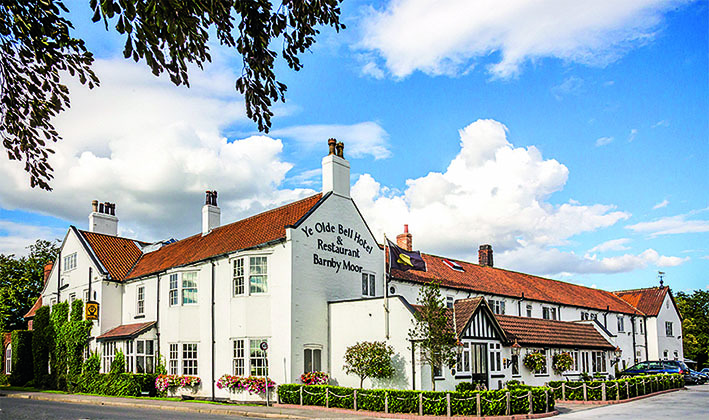 Dine in the olde-worlde Restaurant Bar 1650, which has been awarded an AA rosette, the St Leger Bistro-by-the-Bar, or alfresco on the pretty terraces. Food is beautifully presented, and there’s an extensive wine and gin list and tempting cocktails to ponder over! The food served at the spa’s Herb Garden Brasserie, which offers a top-notch menu complete with careful wine pairing. One night’s bed and breakfast in a double room costs from £99, with spa access from £50 per person. Spa in numbers… Treatment rooms: 6, 2 of which are doubles Therapists: 8 Treatments: 30-plus, with experiences, Wellbeing Wednesdays, cancer care treatments and massages Pools: 1 vitality pool Relaxation areas: 2 plus a reception lounge; a residents’ gym – personal trainers can be arranged Extras: 10 hot and cold thermal experiences; a rasul mud treatment; a Salt Inhalation Room for those with respiratory problems or allergies Fitness areas/classes: Pilates; mindful yoga is coming soon.